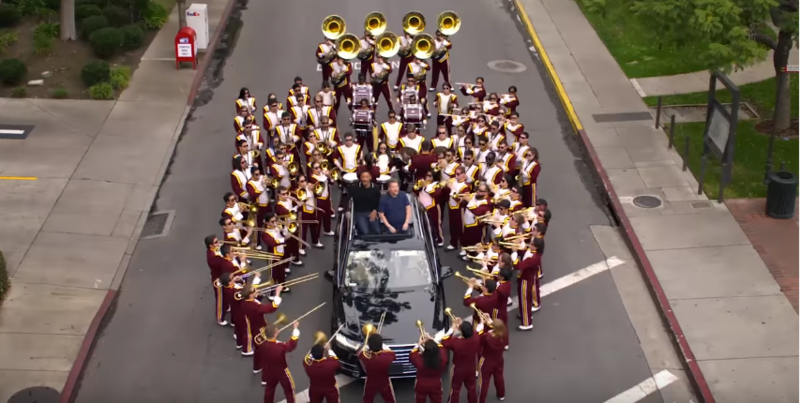 The Spirit of Troy are back at it again and this time they popped up on a the new Apple Music series "Carpool Karaoke" starring Will Smith and James Corden. Watch as Will and James break into "Gettin Jiggy Wit It". As they sing through the song, James stops and says he's been working on his surround sound system. The USC Band marches out and surrounds the car as they drive down the street and sing. Fun Fact: If you notice the band traditionally has a Trojan helmet on the front of their uniform. Because this was filmed on campus, the university rules state that they can't use any recognizable USC marks in the recording. So no capes, no helmet and a white sheet over the Trojan helmet on the front of the uniform to block it out.